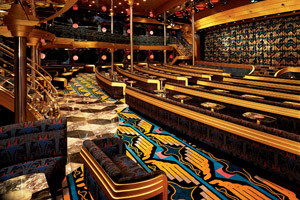 Carnival Ecstasy is a 70,000+-ton Fantasy Class ship that accommodates over 2,000 guests. This ship sails year round from Charleston, South Carolina, making it a favorite vacation choice among many of those that live within driving distance of the port. 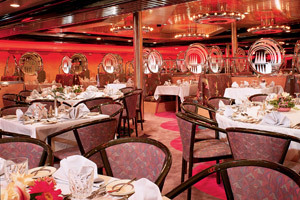 Carnival Ecstasy mainly does 4- through 7-night Caribbean cruises. Among Carnival Ecstasy's many features are a wireless Internet Café, expanded youth program facilities (including a Circle "C" lounge), Carnival WaterWorks (featuring a large waterslide and splash park), a resort-style pool, and the relaxing Serenity Adults-Only Retreat. 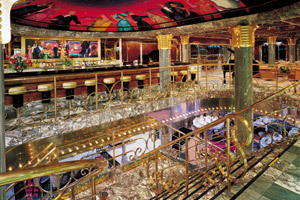 Carnival Ecstasy also boasts private balconies in 98 of the ship's ocean view staterooms, as well as some staterooms with extended balconies. 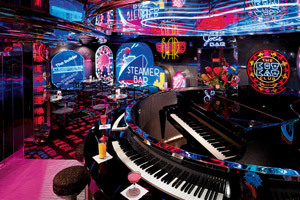 Other exciting features available on board Carnival Ecstasy are a casino, many bars and lounges, multiple dining options (including the ship's main dining rooms, buffet, coffee bar and 24-hour room service), video game arcade, gift shops, as well as a fantastic spa. 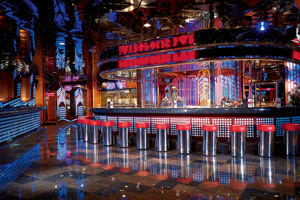 In January 2017, Carnival Ecstasy underwent a two-week long refurbishment that saw the addition of Guy's Burger Join, BlueIguana Cantina, the Alchemy Bar and sweet shop Cherry on Top. Families traveling with children and teens should be happy to learn that Carnival has one of the best youth programs at sea! 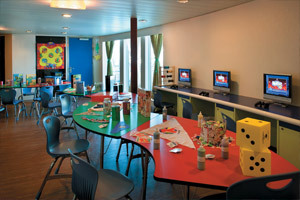 On board Carnival Ecstasy your kids, ages 2 through 17, can take part in many fun activities while cruising. 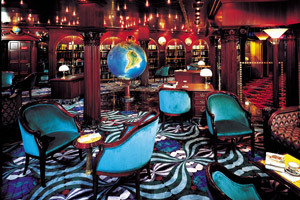 This festive area is featured on many of Carnival Cruise Line's ships, and was recently added onto Carnival Ecstasy. It's an aqua park that features the Twister Waterslide and a splash park. While on your Carnival Ecstasy cruise, take some time and enjoy the pampering you deserve! Spa Carnival offers a wonderful selection of spa treatments, including facials, massages and aroma stone therapy. Feeling lucky? 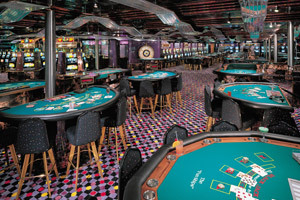 Test your luck in Carnival Ecstasy's casino, featuring blackjack, poker, roulette, craps, slot machines, Texas Hold'em and more! This adult-only retreat, recently added onto Carnival Ecstasy, is a kids-free oasis for those looking to take a break and have some rest and relaxation. There is a hot tub as well as umbrella shaded, plush chaise lounge chairs in this area. Low Price Guarantee on all Carnival Ecstasy Cruises! Book any Carnival Ecstasy cruise with us and you'll get the best deal possible, regardless of the ship or sail date! 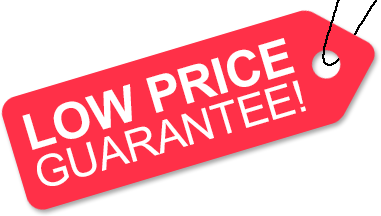 Because of our "Low Price Guarantee," nobody beats our Carnival Ecstasy cruise prices, so look around and you're sure to find the best Carnival Ecstasy cruise deal possible when booking with us! Pre-Paid Gratuities on Carnival Ecstasy Cruises! Get Cruise Cash when you book a Carnival Ecstasy cruise with us. The value of the Cruise Cash depends on the particular cruise and accommodations you book. Cruise Cash values are listed on Step 3 of the online booking process. Save up to 20% on Carnival Ecstasy Cruises! Book a 3- to 5-night Carnival Ecstasy cruise at least 3-months in advance, or a 6-night or longer Carnival Ecstasy cruise at least 5 months in advance and save up to 20%! Plus, get Price Protection from Carnival: If you find a lower Carnival Advertised Rate, after booking, Carnival will honor it and issue the difference in the form of a non-refundable onboard credit. We do not charge booking fees on any cruises! 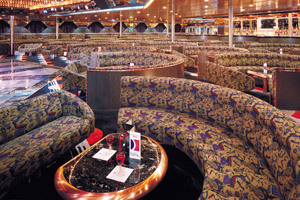 You're sure to enjoy an affordable Carnival Ecstasy cruise when booking with us! Our special offers on Carnival Ecstasy cruises may not be combinable. Certain restrictions apply to each offer. View terms and conditions during the online booking process. 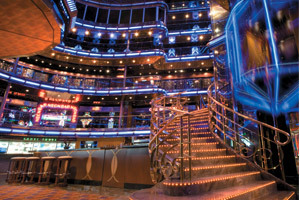 Click a price below to view the Carnival Ecstasy cruises during that month in that destination. Features an extended private balcony, sitting area, individual climate control, private bathroom with Jacuzzi tub and shower, walk-in closet with wall safe, phone, mini-bar, and TV with first-run movies. Features a private balcony, sitting area, individual climate control, private bathroom with Jacuzzi tub and shower, walk-in closet with wall safe, phone, mini-bar, and TV with first-run movies. Features a private balcony, sitting area, individual climate control, private bathroom with shower, phone, mini-bar, wall safe, and TV with first-run movies. Features a private balcony, chair and coffee table, individual climate control, wall-safe, closet, private bathroom with shower, phone, and TV with first-run movies. Features a picture window, with a private bathroom with shower, plus a separate washroom with sink and junior tub, ample drawer and closet space, hairdryer, mini-bar, mini-safe, interactive TV, complimentary use of bathrobes, bathroom amenities kit and telephone. Features a chair and coffee table, individual climate control, wall-safe, closet, private bathroom with shower, phone, and TV with first-run movies. Features two portholes, a private bathroom with shower, television with remote control, complimentary room service, and vanity area. Features upper and lower beds, as well as a chair with coffee table, individual climate control, wall-safe, closet, private bathroom with shower, phone, and TV with first-run movies. Category OB suites have an obstructed view.